Last week, I had the privilege of traveling with my wife and our friend, Ryan Klinck, to just outside of Philadelphia to participate in the opening worship service of the Eastern Pennsylvania Annual Conference. The sermon theme was how we are all the body of Christ, according to 1 Corinthians 12. The Annual conference itself has a theme of including persons with disabilities in the leadership and greater life of the church. It was an absolute privilege to see a wide variety of disabilities represented throughout the carrying out of the liturgy and in leadership of the service. I remarked to Bishop Peggy Johnson before I began preaching that it is not fair that a service would make me cry right before I am supposed to deliver the sermon, but the diversity of embodiment on that stage nearly brought me to tears. 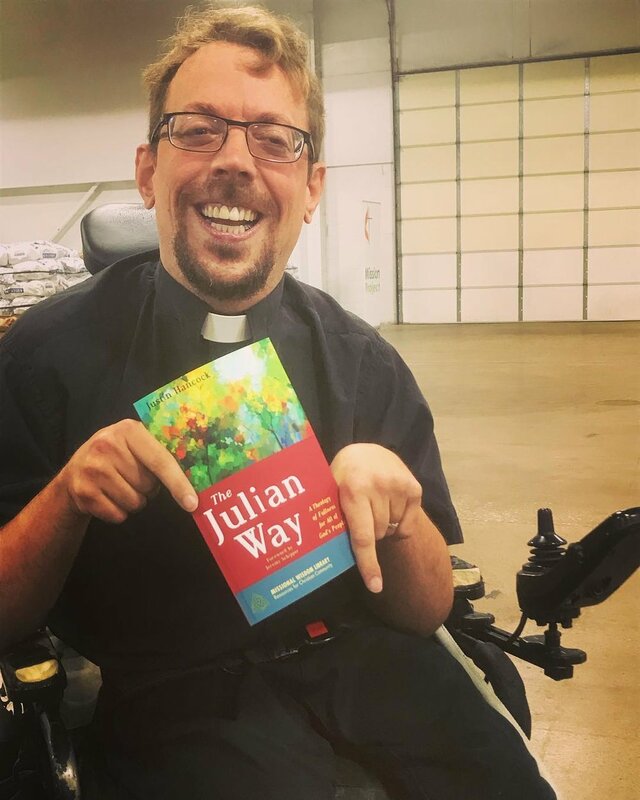 I also got the privilege of débuting my book, The Julian Way: A Theology of Fullness for all of God’s People while at the conference. Throughout the three days at our booth, I was extremely moved to hear from parents and caregivers that they were excited to read a book that would put their journey of faith with those they love at the center of theology, allowing them to maybe hear their own story in a new way. One of the points of interaction that I maybe did not expect to be quite so strong was with those individuals who had lived through the pre-ADA struggle for disability civil rights. I told people what the book was about, and several times got people responding with “I was there” for certain events, and “It will be very interesting to see that history on these pages.” I find that kind of comment most exciting because I want The Julian Way to not just be a story about disability history or theology, but to be a story of our history as the shared people and community in Christ.